Whether you're a member of a gym or fitness club or use home gym equipment, it's important you know how to use it properly so you won't sustain any injuries.Overuse and misuse of equipment are the causes of a high percentage of injuries that happen in the gym. So here are some tips on what to look for and how to use the equipment safely. If you are buying equipment test it before you buy. Before using any equipment check that it is safe and stable that there are no loose nuts or screws on the machine. 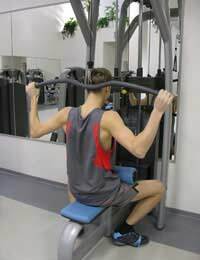 If the machine rattles or works with a jerking motion while doing an exercise stop immediately. Keep young children away from home gym equipment. If using a treadmill at home make sure your child doesn't get too close as there are a number of increasing incidents where children get their hands caught in the running mechanism of a treadmill. Unplug any equipment when not in use. Check cables on weight machines to make sure they're not frayed or damaged. Make sure cables are covered with a protective sleeve. When buying a machine that needs electrical power, make sure the electrics are covered by the warranty. The type and standard of equipment you buy is up to you. It will depend on the standard of fitness you expect to attain. Every machine exercises different specific muscles, or are designed to help increase strength and stamina. It's important that you choose one that's going to fit your requirements. Exercise Bike- A typical piece of equipment found in fitness centres and as part of a home gym. It's aimed at using the leg muscles while putting the minimum amount of strain on the joints. Exercise bikes are ideal for older people. They give a gentle yet ideal cardiovascular workout. Most bikes have settings to increase the difficulty of the exercises. A full workout programme can be designed for the exercise bike. They are ideal for people who have an upper limb injury and are wanting to keep their fitness levels up. Stepper- Provides a workout for the legs, glutes and thighs. These machines basically reproduce the movement of climbing stairs with their two steps. Basic steppers are relatively cheap to buy and are a good way to start building up your home gym equipment. Expensive models come with handrail grips and heart monitors. If you have hip or knee problems then you need to consult with your doctor before using steppers. Set at a low resistance level the stepper can provide a good workout and can improve oxygen intake capacity, and benefit the heart and circulatory system. Set at a high resistance level the stepper improves muscular fitness, especially in the buttocks, back, thigh and calves. Rowing Machine- Provides a good whole body workout. Chiefly aimed at training arms and upper body. If buying a rowing machine make sure the seat supports the lower back. If used correctly the rowing machine is easy on the joints while effectively working all the muscles. Before using a rowing machine consult with a qualified trainer to get the correct technique and starting position. Used incorrectly the rowing machine can quickly lead to back pain. Rowing machines can be used as part of a weight loss programme as they burn up a lot of calories if used properly. All ages and all levels of fitness can use a rowing machine. They are a great aerobic exercise and help strengthen the abdomen, back and shoulder muscles. To get the maximum strengthening effect for the arms it's important to keep them tight into your side. Cross Trainer- No this isn't what your instructors are like when you can't do an exercise properly! It's a machine that combines the characteristics of a rowing machine, stepper and treadmill. The cross trainers is also known as an elliptical trainer and is becoming increasingly popular. Provides a whole body workout. Movements are easy and effective, while being easy on the joints. Gives you maximum workout for the minimum amount of time. Great for burning calories and firming and toning the body. Always hold an upright position when exercising on a cross-trainer. Don't hunch over the bars, make sure your body weight is being supported by the lower body throughout the exercise. No matter whether you are exercising at a home or in the gym always learn the proper techniques for using these machines. Failure to do so may result in an injury. First site I've found that doesn't try and get me to sign up to something and that actually gives me straightforwartd info re what machines do what- just wish it also touched on the other machines in the gym- the weight machines.